Traditional full dentures are an ideal option for those needing to replace all of their teeth. A full denture is a removable appliance, typically made of acrylic, designed to replace an entire arch of teeth. 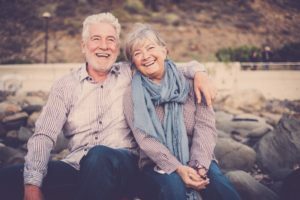 Today’s modern dentures are thoughtfully designed keeping things like your facial structure and skin tone in mind, for the best fit and most appealing aesthetics. Because traditional dentures are removable, they rely on a secure fit and suction to the jawbone to stay in place. They can be removed at night for cleaning and will need to be relined periodically by your dentist to ensure a snug fit. A partial denture is a good option for those missing a few teeth, but who still maintain a large number of healthy teeth. A partial is also a removable appliance that fits much like a retainer, and it utilizes strategically placed prosthetic teeth customized to fill in the spaces left by your missing teeth. Partials utilize clasps that anchor to your healthy teeth to ensure they stay securely in place. Dental implants can be used to support dentures. Your denture can be designed to “snap” into a few strategically placed dental implants, which provides a secure and stable fit with no movement when you talk or eat. Dental implants also provide the added benefit of protecting the health of jawbone by keeping it healthy and stimulated. This ensures there is no bone deterioration, which also promotes longevity for your denture. Would you like to learn more about your options and determine which one best suits your needs? Contact your dentist in Midland today to schedule a consultation. Your talented dental team at Boyles General Dentistry and Implant Center in Midland, TX combines the expertise of not one, not two, but three highly skilled dentists. We specialize in creating high quality dentures you can be proud of, and we even create them in-house. If it’s implant dentures you seek, we can guide you through the process from start to finish here at our office. To contact our dentists, call us at 432-685-7011 or reach us through our website.